We’re going to do something different here. I’d like to show off Ian Greenlee’s art in a unique way. 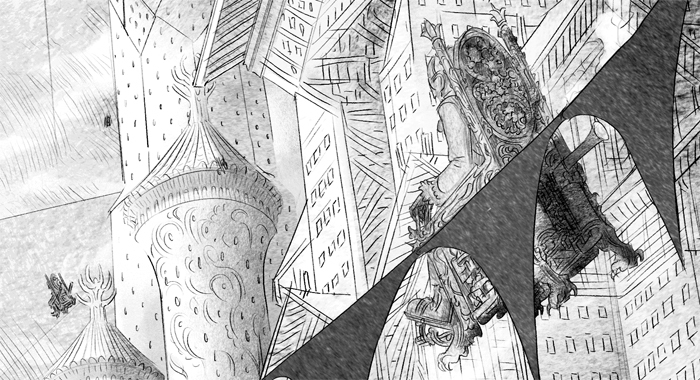 Ian’s work is spectacularly detailed. He works on a canvas the size of a house and loves to dive into minutia like no one else I know. To show this talent off I’m going to reveal his latest piece. 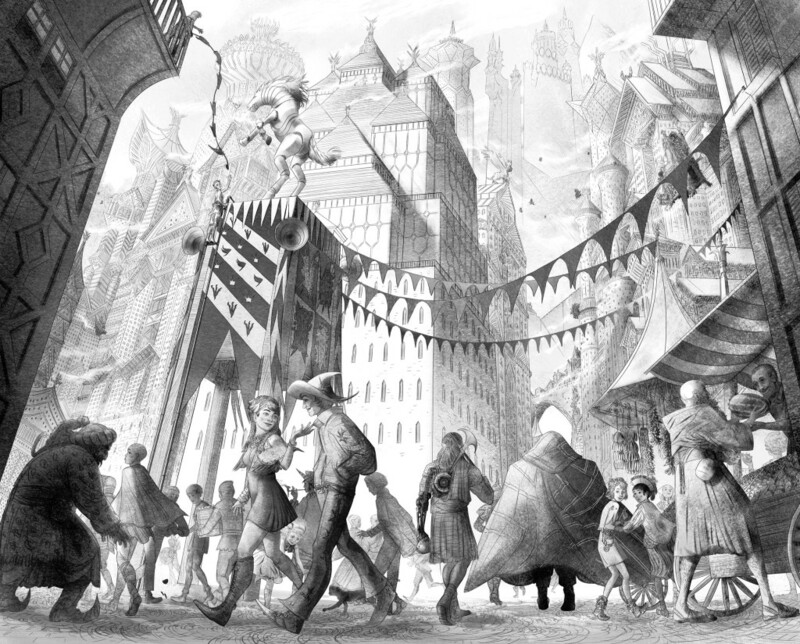 It captures the moment that Simon Sharp walks into the fantastic town for the first time. I think Ian does a brilliant job of making us feel the awe that Simon felt. When you see the full piece all together, you’ll see what I mean. I’ll update this post once per day until the softcover launch on December 12th, so bookmark it and come back to see the full illustration slowly come to life! Enough talking! 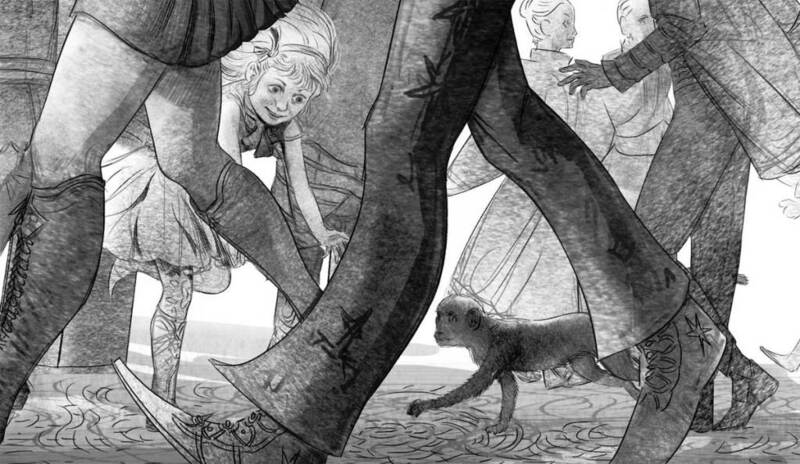 Take a look at this first tiny slice of a masterpiece! Slice #3: Watch Your Head! 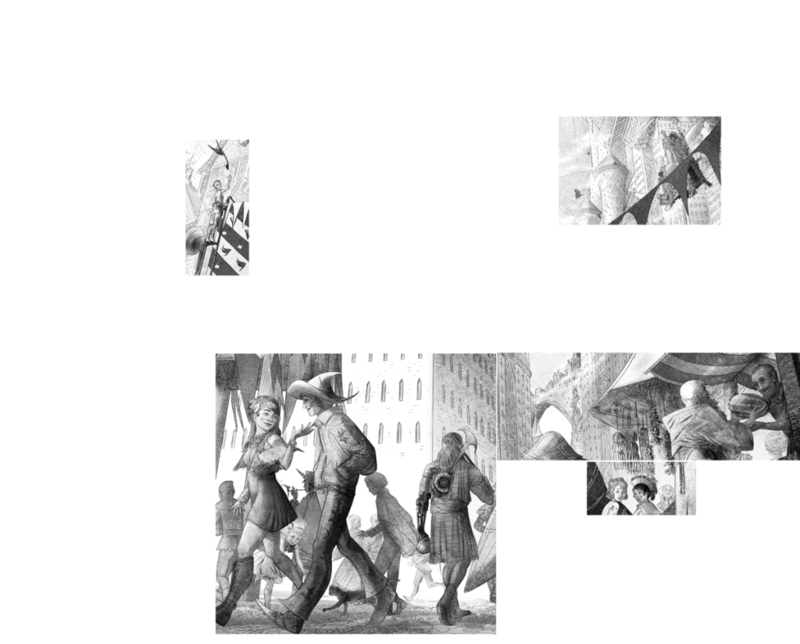 Any of these illustrations have enough detail to satisfy most artists. Not Ian. THIS is how big the above images are in comparison to the full piece! And HERE is the full piece! Poor Simon. He’s had a horrid run of luck recently. A couple of bad decisions became one HUGE problem for New Camelot — a problem that looks a lot like a dragon. But he’s determined to find a way to make things right. And the only way he can do that is to go back to his Uncle Victor’s castle. Let’s just say Simon isn’t welcome there anymore. 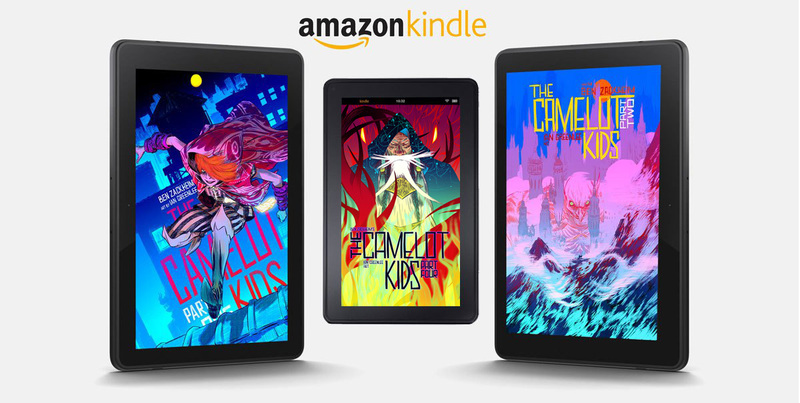 Snag a copy of The Camelot Kids: Part Four and see how the first part of Simon’s story comes to an end. There’s adventure, battles and betrayal the likes of which you’ve never seen before. And THANK YOU. 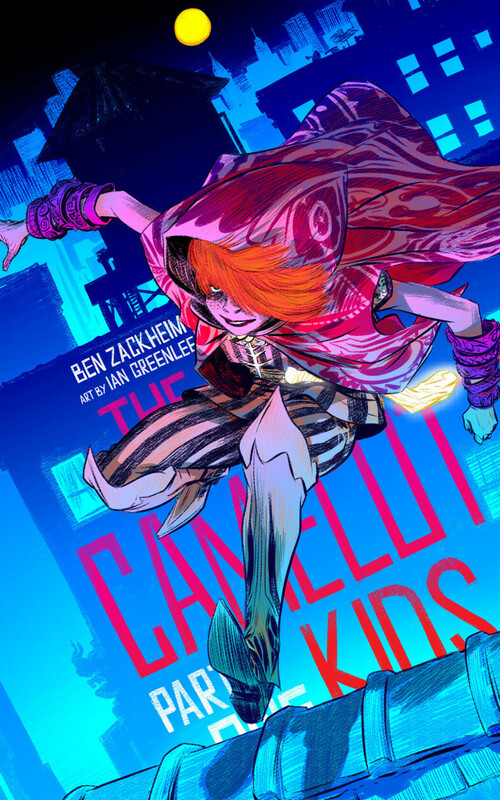 This run of The Camelot Kids has been the time of my life! I can’t wait to release the softcover book on December 10th, with art by Ian Greenlee, Nathan Fox and Matt Bailey. Part One of the book introduces 28 characters. Not easy to do with 120 pages. Nathan’s cover and Ian’s illustrations were that much more important because of this challenge. Nathan’s version of Maille Rose has a lot of heart in it. And action. And mystery. Typical Nathan. Part Two is where magic peeks over the horizon of reality and goes BOO! Simon Sharp may have a hard time accepting it, but he can’t deny trolls and 7 ft elderly wizards and floating chairs. This cover creeped me out when I first saw it. My eyes were drawn to the eyes after wandering through the haze for a split second. Nathan is constantly thinking about the way his audience experiences his work. Part Three is the first part of the story where Simon is swimming (sinking?) in a world of magic and danger. We get to see him fight with the knights of New Camelot. We get to see what Uncle Victor is up to. And we get to see the opening sequence of the finale! This cover is just so flagrantly powerful. Just like its subject, Uncle Victor. The Camelot Kids: Part Four reveals the plot, the players and the victims. Nothing will be the same again in New Camelot. 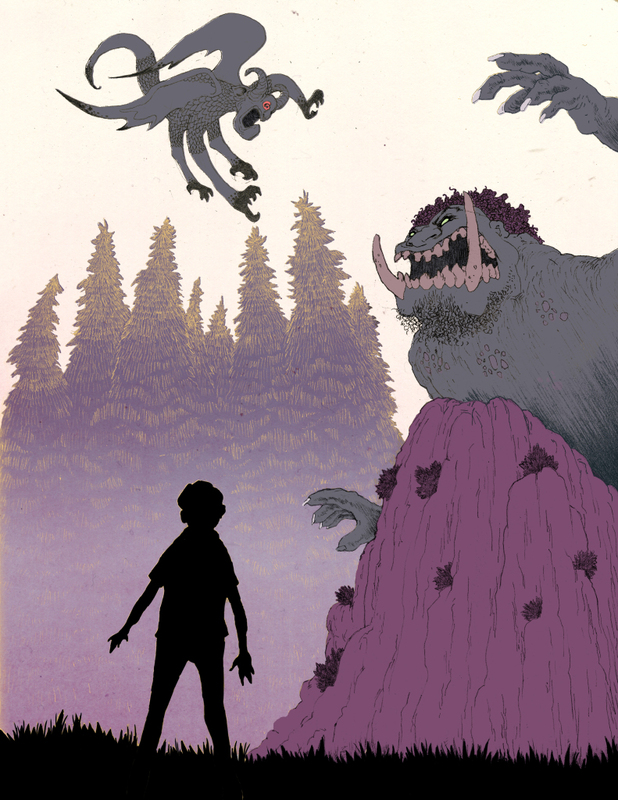 If you’ve read The Camelot Kids: Part One you’ll remember the fight between the gargoyle and the troll. Simon will certainly remember it for the rest of his life! 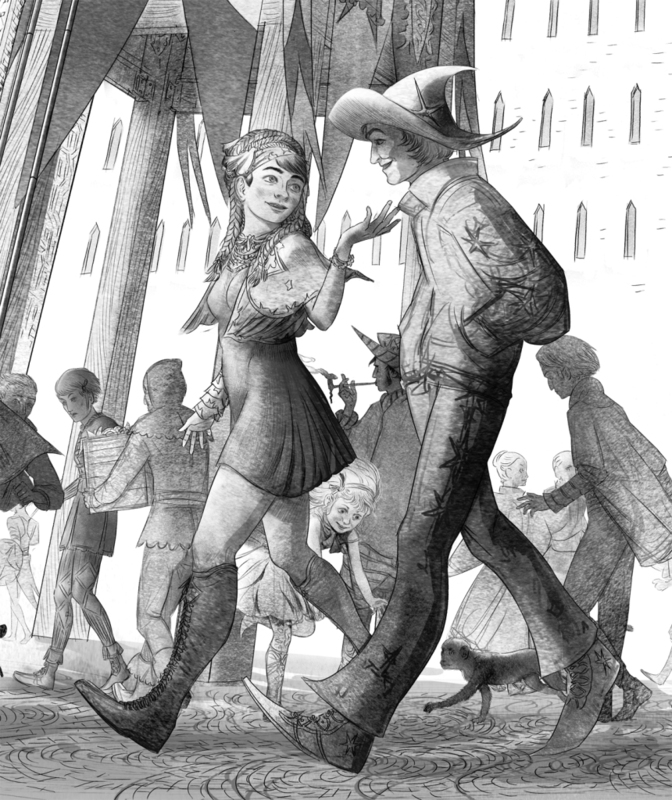 Ian Greenlee did a fantastic job of drawing that scene for the book, but I wanted to get another point of view from an artist with a different style. I met Harshad Marathe at my parent’s place in New York. They introduced him as an artist. He was helping them settle into their new apartment and we got to talking about Camelot, myth and art. I was so impressed with the beautiful way he sees the world that I assumed his artwork was as expressive. Harshad Marathe is a fantastic talent who drew this scene from The Camelot Kids. I love Harshad’s whimsical style. It captures the child-like wonder that Simon must be feeling as he watches two monsters fight! You can see more of Harshad’s work here. 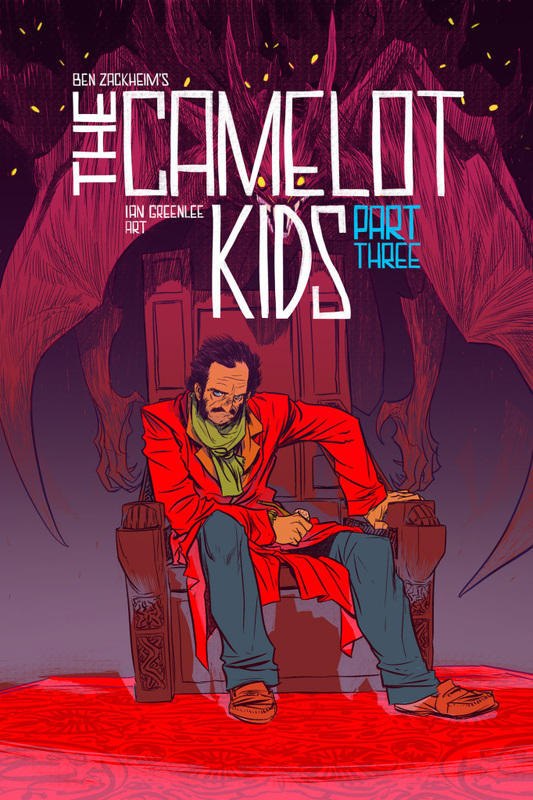 The Camelot Kids: Part Three has a cover! Nathan Fox’s Uncle Victor is sweet. Are you ready to see the next Nathan Fox cover? 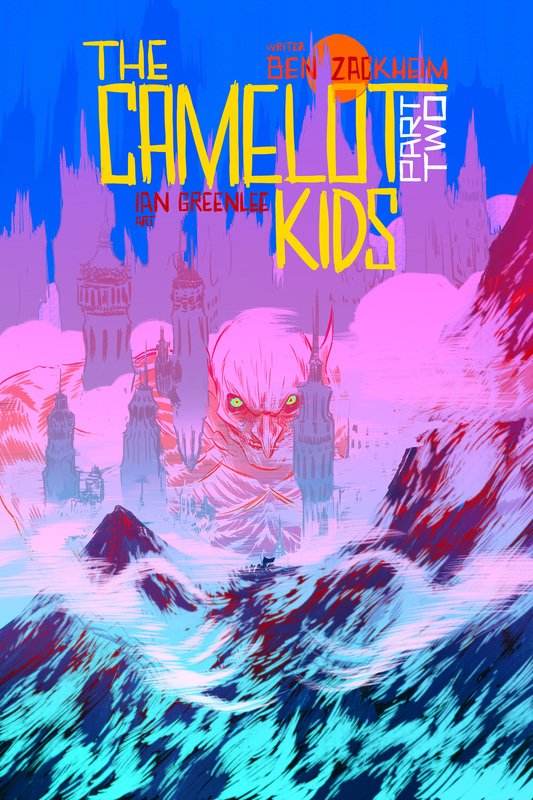 The Camelot Kids: Part Three is almost here, and I have the cover to prove it. You may have seen the teaser at the top of my Facebook page. Well, here’s the full deal. What do you think? 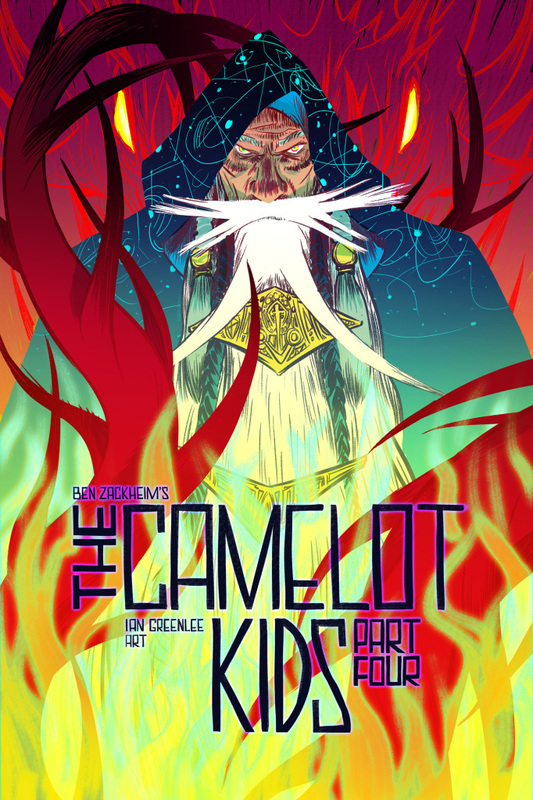 Pick up The Camelot Kids: Part One to see Merlin and the teen descendants of the Knights of the Round Table try to get along. It’s a hoot!